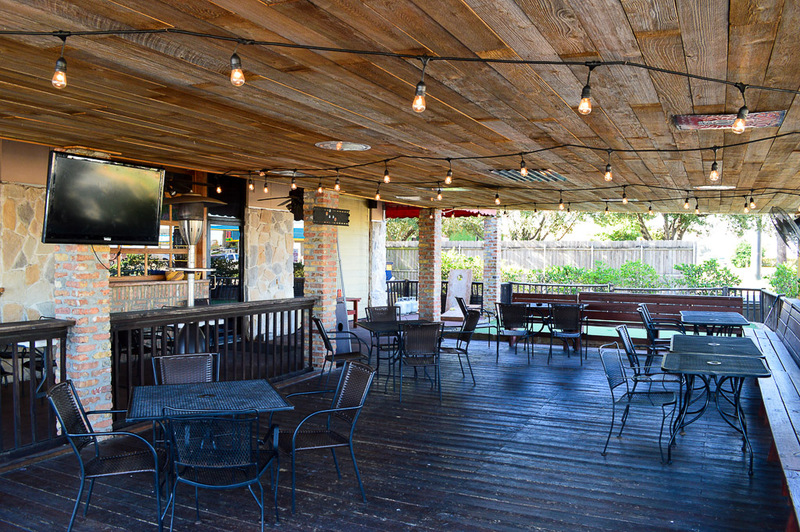 Texas Mesquite Grill is located in West Houston, right off I-10 the Katy Freeway and S. Mason. 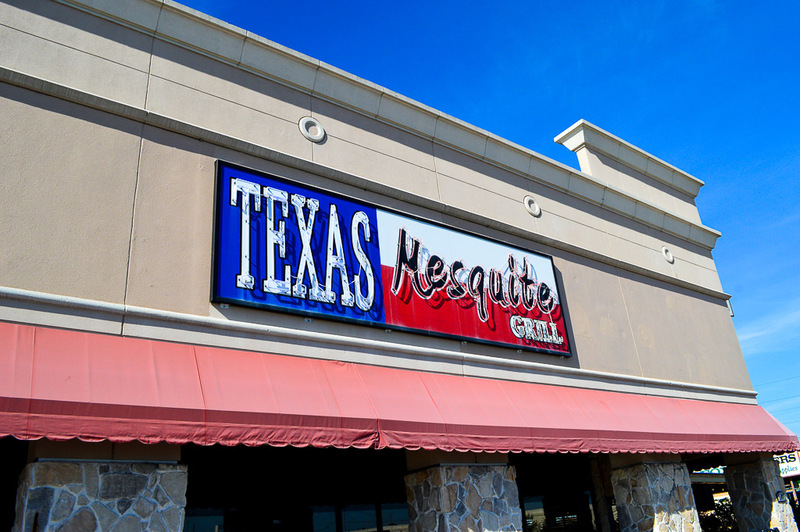 Like most people in Texas, I am a sucker for that mesquite flavor we are known for here in the Lone Star State. 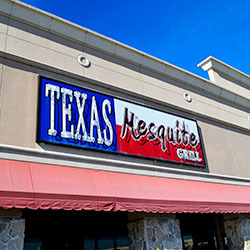 Well, at Texas Mesquite Grill in Katy, they have that delicious flavor bellowing out of every bite. 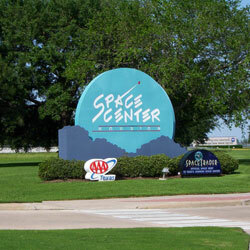 We stopped by on a Saturday afternoon – a Fall afternoon in Texas to be exact. And you know what that means… FOOTBALL! The first thing I noticed as I walked in was how beautiful this restaurant is. 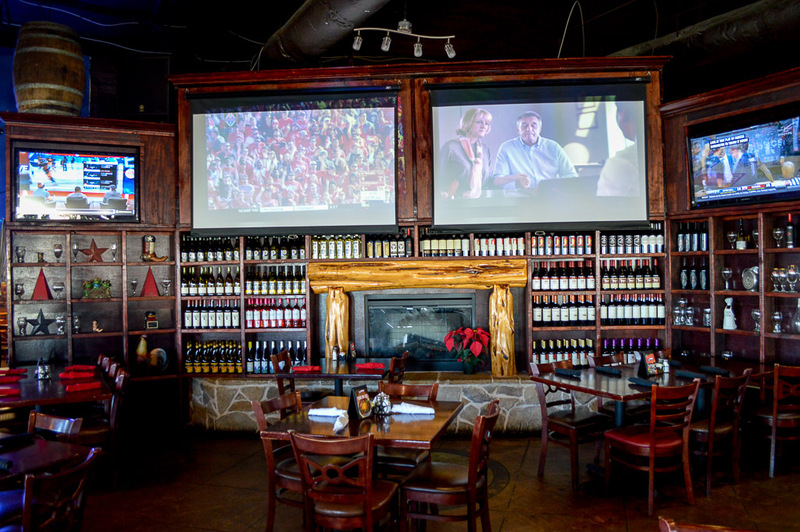 There is an enormous fireplace in a dining area equipped with many large screens and flat screens. That way, nobody misses any of the sports action. After we watched part of the game and finished our No Label craft beer, we headed back into the dining room and got started on a nice, little Texas feast. 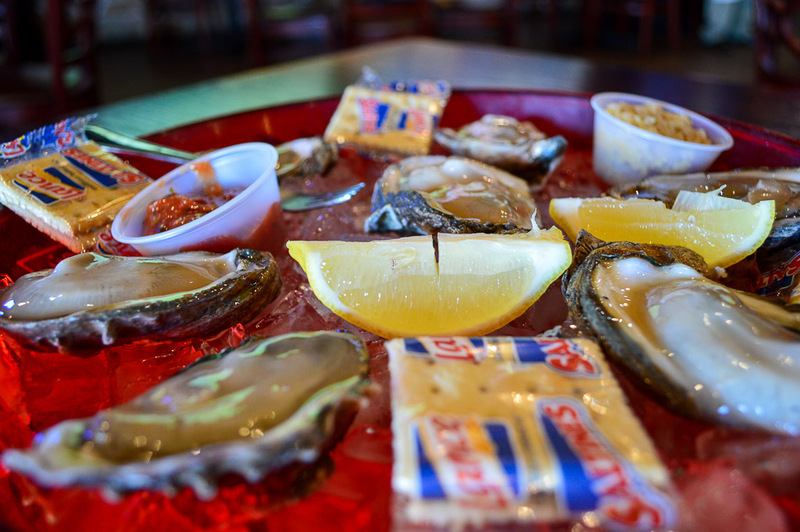 We started off like any good ‘ole boy would with a ½ dozen Gulf Oysters and the Sampler Platter. 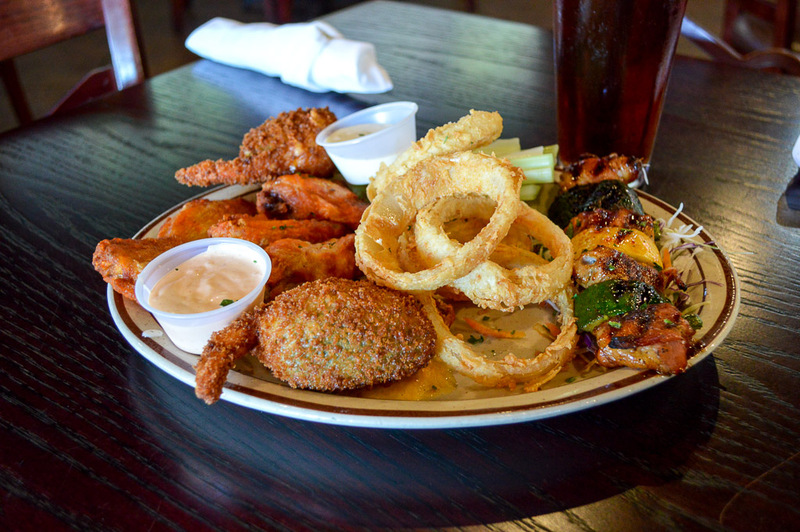 The Sampler Platter comes with Wings, Armadillo Tails, Quail Bites and Onion Strings. 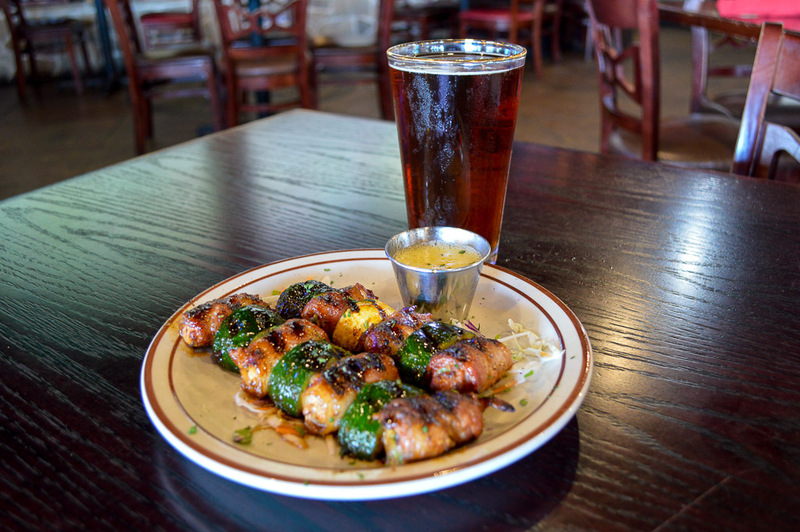 The Armadillo Tails were built with jalapenos stuffed with shrimp and pepper jack. The jalapenos were not too hot, but combined with the shrimp and pepper jack, gave a great flavor. The kind of flavor that had me looking for another bite once I had finished the first. I reminded myself to stay patient as this was going to be a long day. Ha! The Quail Bites, bacon-wrapped quail breast stuffed with jalapeno and jack cheese, are a must-try for everyone who walks through the door! If you are a Texas resident, then I’m sure you have had this delightful app a number of times. 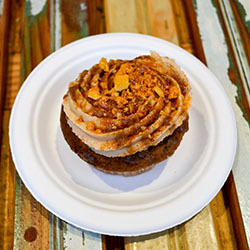 But, if you are visiting or just new to the area, you are sure to love this… so good! The Oysters never disappoint me on this side of the map. 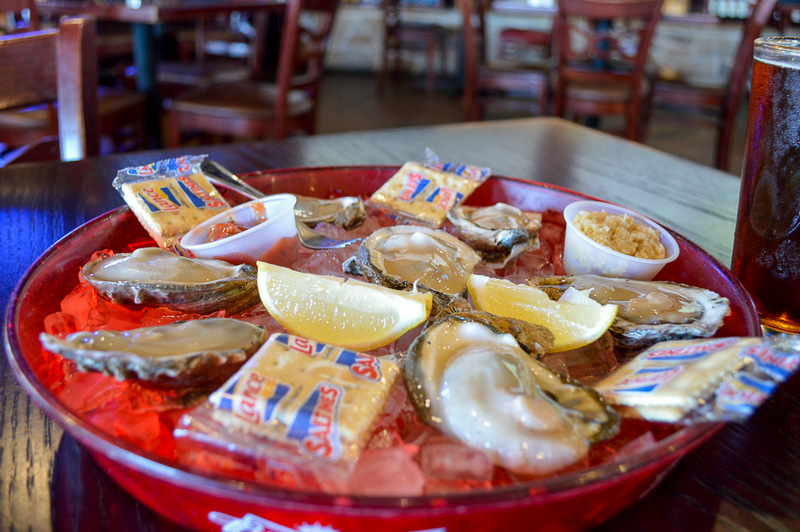 Large Gulf Oysters were a great addition to the Sampler Platter and were divine along with my newly-found friend sitting in front of me – a pint of No Label 1st Street Ale. 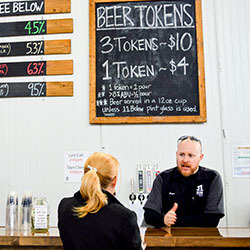 The No Label brewery is located not too far from where I sat, which somehow made it even more enjoyable as I reminisced about my last trip there. 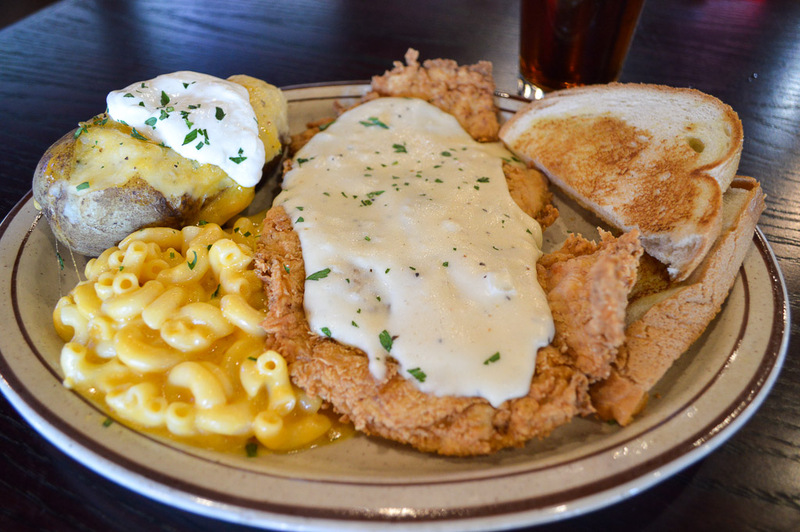 Now, I never truly feel like I am in Texas unless I sample the Chicken Fried Steak. The Chicken Fried Steak here at Texas Mesquite Grill in Katy is made with Rib-Eye instead of the usual Skirt or Flank Steak. 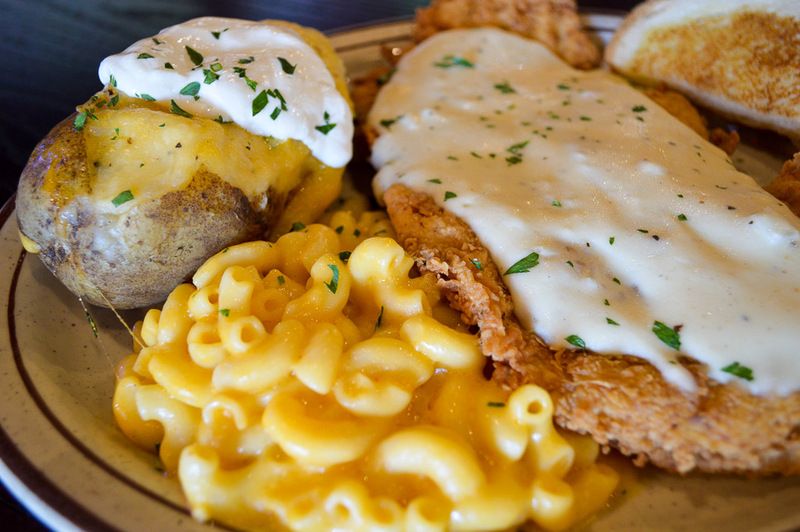 That just made this entrée even better – definitely a smart choice! 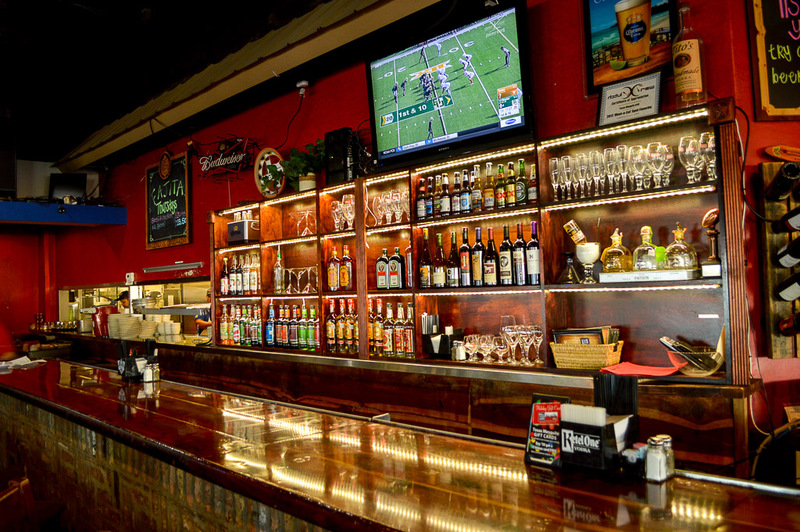 I also enjoyed the Mac and Cheese and Twice-Baked Potato as sides… oh and, of course, the Texas Toast. Is that something you would be interested in? 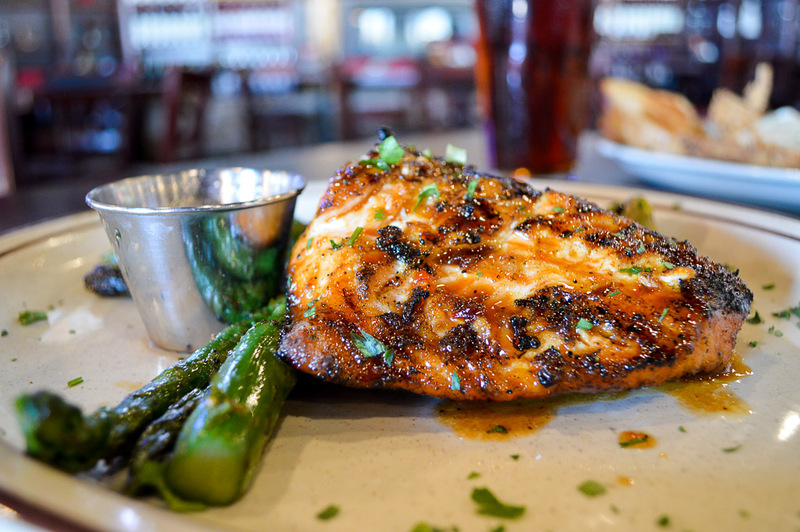 Now, a number of people had recommended we try a fish entrée as it is one of the specialties at Texas Mesquite Grill. 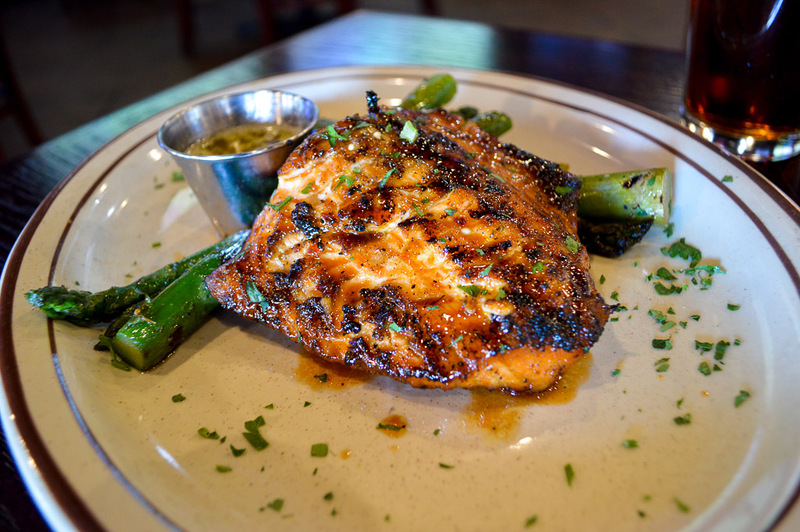 After getting advice from our server, we decided on the Grilled Salmon. Thanks for the tip! The Grilled Salmon was amazing! I’m not sure exactly what I was expecting, but it far exceeded my expectations. 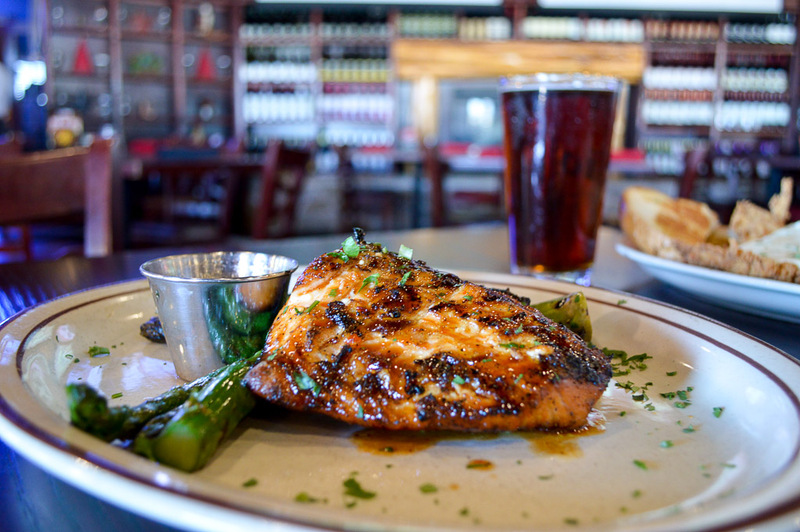 The mesquite-grilled salmon brushed with an ancho honey glaze and served with asparagus was out-of-this-world! Everything was beautifully prepared. And the ancho honey glaze? Forget about it! 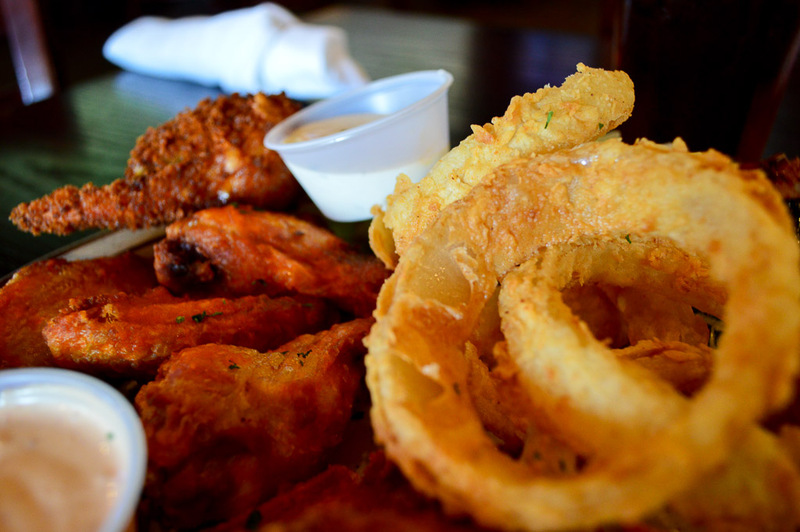 My mouth is still watering as I write this. Just take a look at the photography and see for yourself. Now, last, but definitely not least, was dessert. They offer a wonderful selection of desserts here. I noticed one of the servers making his way through the room carrying a plate that displayed them all. 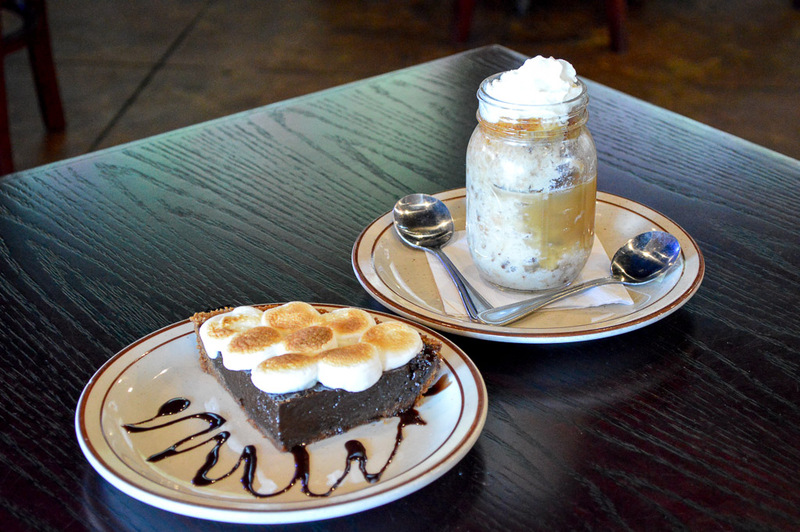 This enticed me to order the S’mores Pie and the Bread Pudding… a decision I would not regret. 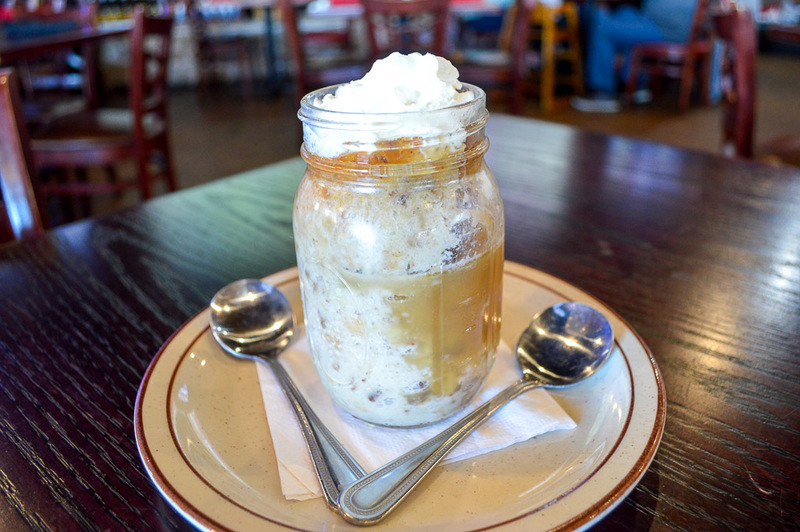 The Bread Pudding was a traditional bread pudding made with pecans and housed in a Mason jar – which gave it an extra Texas touch. Nice! 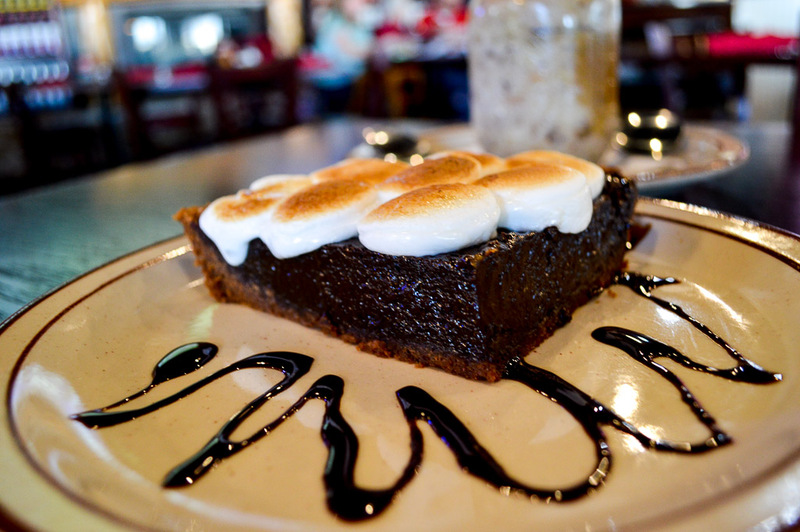 My favorite of the two was the S’mores Pie – Chocolate pie with Graham cracker crust and roasted marshmallows. Reminded me of the old-fashioned camping treat… 2.0 ha! The chocolate was rich and delightful. The combination of marshmallows and Graham crackers allowed those childhood memories to take over as I enjoyed this wonderful dessert. Just so you know – this is one of the longest visits I have ever made when visiting a restaurant. In all, we were there for over 5 hours. Does that tell you something? 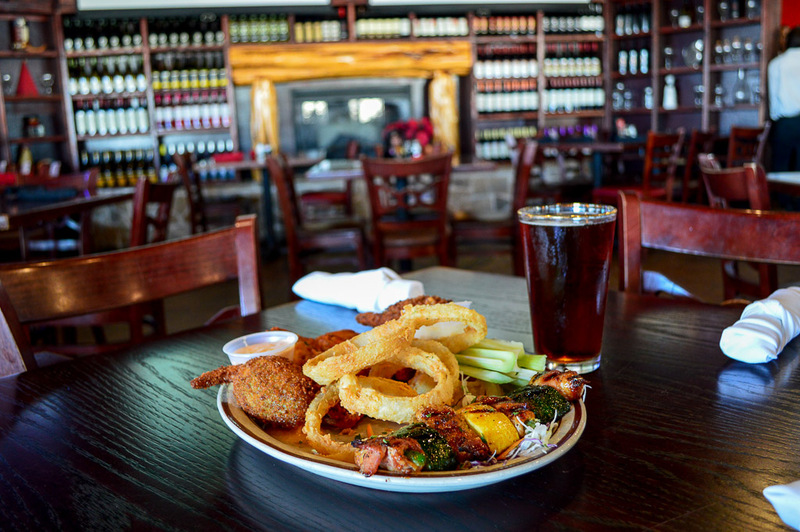 Texas Mesquite Grill is more than just a restaurant. 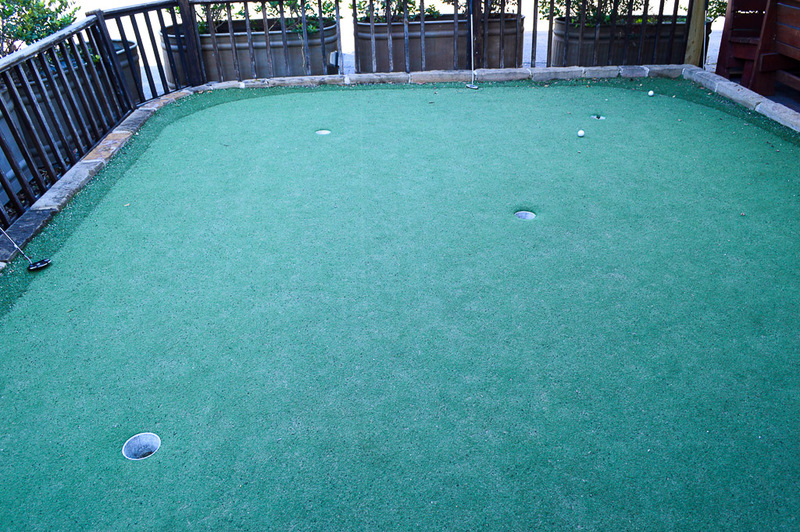 It is an experience that entertains you for hours. 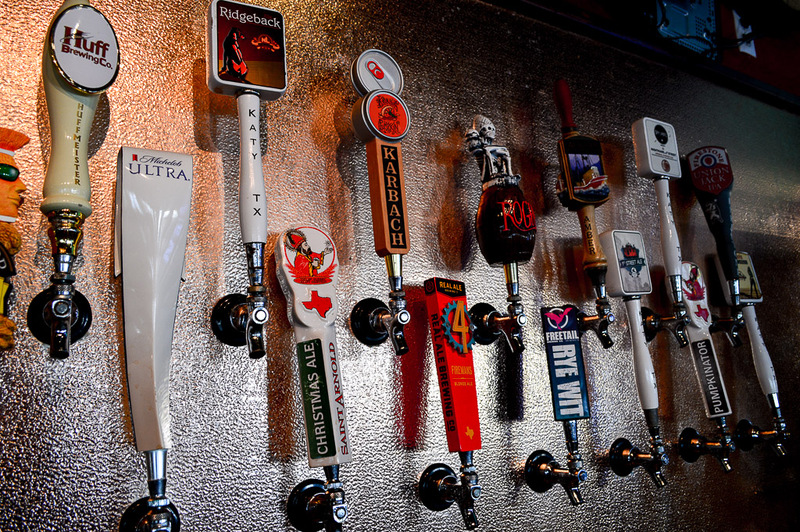 You have wonderful Texas favorites from starters to desserts, along with Top Texas Craft Beer, golf and all the sporting events at your fingertips. 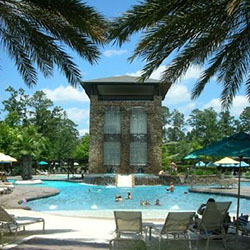 Let’s just say… I could live here!